There’s more humor than meets the eye in a bathroom where lighthearted spirit makes a strong impression. 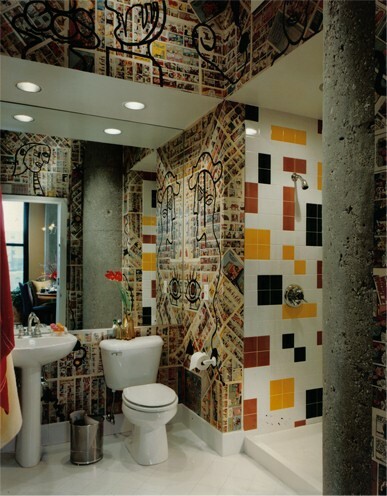 Newspaper comic strips were pressed into action as wallcovering before being glazed, then superimposed with Picasso-like images. A random smattering of colorful wall tiles compliments the wall treatment. The design of the intricate mosaic marble pattern on the ceiling and walls of a Roman-inspired bath took weeks of our time to complete. Part of an interior renovation, it is one of three and one-half new baths we created in the penthouse of 1550 N. State Parkway, a circa 1913 Beaux Arts building in Chicago. Artisans hand-cut each tile to fingernail size to achieve the distinctive Byzantine pattern. Our dramatic, fully appointed master bath suite adds an appropriate current touch to a residence we designed as a reinterpretation of one of the historic homes that belonged to some of Chicago’s prominent pioneer families on historic Prairie Avenue. We eliminated a proposed study to capture space for this elegant retreat and paneled the tub apron to allow easy access to its mechanics. 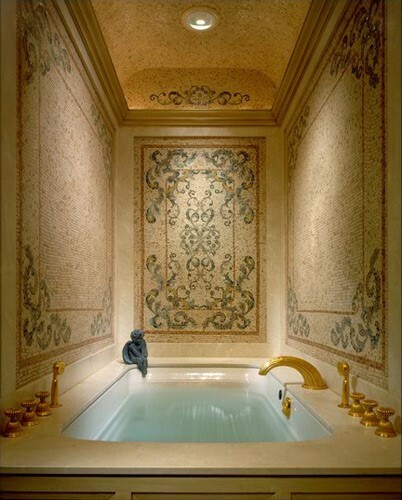 The delicate balance of ivory tones synthesizes with Crema Marfil drawing the eye to a 1,700 year old Turkish stone mosaic a penthouse owner has prized for years. To maximize the feeling of space, we integrated the shower pan and tub and chose cold cathode lighting to illuminate the perimeter of the dropped ceiling resulting in an ethereal glow throughout the setting. In Los Angeles we sacrificed a sitting room adjacent to the master bedroom to achieve a sybaritic, minimalist spa. This classic Hollywood bungalow is furnished and frequently leased to high-profile visitors. 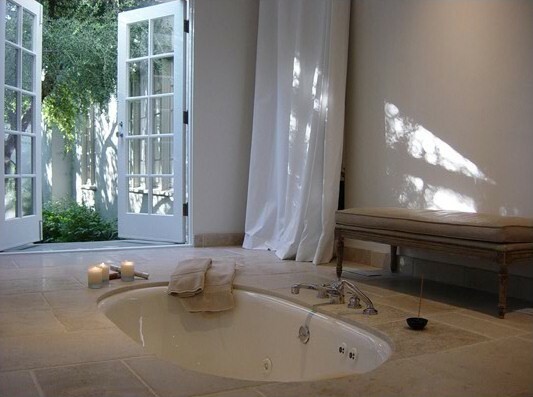 The soaking tub was installed beneath the limestone floor to maximize the views of the surrounding rambling garden and enhance the zen-like setting. As with every project, each detail of this shimmering powder room originated in our minds long before construction began. From the ingenious art of the exceptional white gold light fixture, to the framed Picasso on the wall, to the total absence of water supply and drain, this bathroom is a jewel box tucked artfully into a Trump Tower Chicago residence. 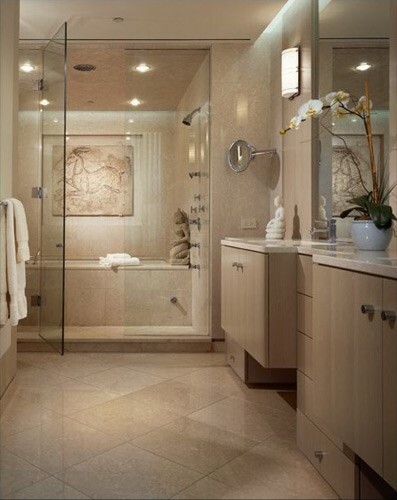 When it comes to the 21st century bath scene, our vision is limited only by our clients’ desires. We are forever eager to combine your dreams with emerging technology and the latest products to produce the most amazing results. You’re invited to share with us your dreams of a sensuous luxury space. We will create a way to turn them into reality. In our next blog we will share with you our latest ideas for a truly chic and stylish residence in the newest building to grace Michigan Avenue. 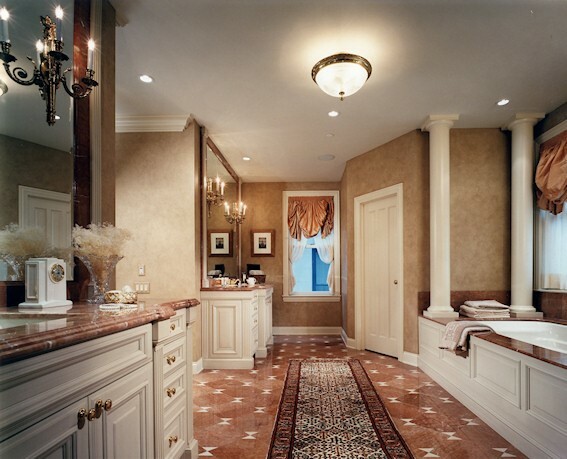 I particularly like the shimmering powder room and one with the Ivory tones. Beautiful spaces John… so much character. I also really want to take a bath now! Hot bath, bottle of wine and a good book! Your work is so stunning, it takes my breath away. Much Shelist Denenberg Ament and Rubenstein, P.C. If I had baths like these fabulous ones, I’d probably refuse to go to work!!!!! What wonderful installations. Thank you for sending this to me. What a gorgeous collection of bathrooms and what a great idea to showcase them this way. You are brilliant! Owen tells me you are extremely busy as you deserve to be. We hope to see you soon. Love to make a date with you and your friend…. Let us know when you both are in town. WOW…so beautiful….you are so amazingly talented John.